« The Secret to Making Your Financial New Year’s Resolutions Stick – You! It often shocks me to see what passes for “journalism” these days in publications many people put their trust in, like the Wall Street Journal. 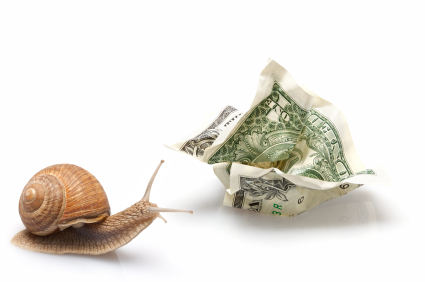 A recent article in that publication titled, “Slow and Steady Saving Still Pays,” is a classic example of what happens when you use fuzzy thinking and math… and expect to convince readers of your position. Sadly, I suspect many readers did lap this article up because, after all, it was published in the Wall Street Journal. They wouldn’t lie to us or lead us astray, would they?!? I don’t think this article was intentionally written to mislead you. I believe the author has just been as brainwashed by Wall Street as most Americans have been. So what ARE the problems with this article? The article’s premise is that “patience pays off” on “the path toward having enough money to enjoy a comfortable retirement.” And that it would even have paid off over the past decade. To support this premise, the author uses the example of a person making $40,000 per year in 2000 who contributed 6% of their salary – $200 per month – in the first year with a company match of 3%, or $100 to start. That money goes in an index fund that tracks the S&P 500.
for an eye-opening comparison of saving money in a Bank On Yourself policy versus investing in the stock market. The author then presumes that person gets a 3% raise each year, with her contributions – and her employer’s match – rising accordingly. Woohoo! A 14% gain over an entire decade! So what’s wrong with the picture?!? Before I get into the wealth-killing, fuzzy thinking the author used to draw this conclusion, I encourage you to take a moment and see how many examples of fuzzy thinking you can find first. Inflation would have eroded the purchasing power of your money by almost 30% during this period. That means that this saver would actually have to have $67,600 in her account now, not $52,000, just to keep even with inflation! How can you improve your financial picture? 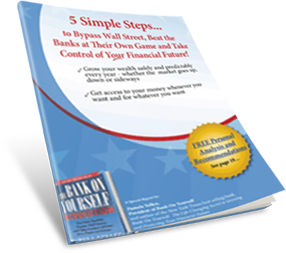 Find out why wealthy Americans have long used the Bank On Yourself method to grow and protect their wealth – and how you can, too. Request a Free Analysis that will show you how much your financial picture could improve if you added Bank On Yourself to your financial plan. 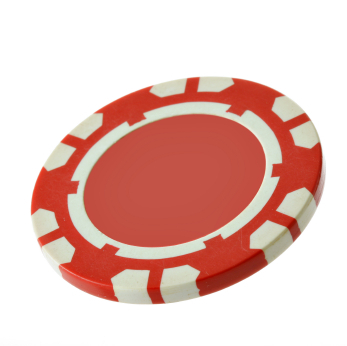 And what’s the difference between putting your own money at risk to get the employer match and going to a hot Vegas casino because they offered you $20 of free chips, as long as you plunk down $100 from your own pocket? It’s still gambling! The 401(k) management and administration fees are major wealth killers in themselves. As noted by the Department of Labor, even a 1% increase in fees can consume 28% of the value of your 401(k) over time. And ever since the government passed a law in 2006 giving employers protection from liability if they put your money in so-called “Target Date” funds, many have automatically been moving employees’ money into those funds – even if they had previously chosen a different fund. Pulitzer Prize-nominated journalist Dean Rotbart and I wrote an exposé on 401(k) abuses recently that I encourage you to check out. 401(k)’s appeal to people because they let you defer your taxes. But what direction do you think tax rates will go over the long term? 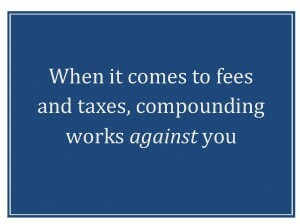 The problem with deferring taxes is that, if you’re successful in growing your nest egg, you’re most likely going to end up paying higher taxes on a bigger number. Even if you did actually end up with a 14% total gain over the last decade (you didn’t for the reasons described above), was it worth all the sleepless nights? Remember – you don’t have to accept risk or volatility in order to grow a substantial nest egg, as more than 500,000 Americans who use the Bank On Yourself method have already discovered. To find out how much your wealth could grow – safely, predictably and guaranteed – if you added Bank On Yourself to your financial plan, request your FREE, no-obligation Analysis now. Fuzzy thinking has run amok all over the country and a lot of it comes down from our illustrious government. There are better ways! They aren’t supported by an army of brokers, bankers and bureaucrats though. Of course nor do they have to support PAYING for that army of brokers, bankers and bureaucrats! 1) Having to sell your shares in retirement at a time when the market is down due to a financial crisis (more of those coming). 2) If you think that you can choose when to sell, do you think that the federal government is going to keep waiving the minimum distribution rule? They need the tax revenue. 3) Depending on your age, you will probably have to sell shares at the same time all the Baby Boomers are having to sell. Pamela’s comment on inflation is especially critical. Most people will believe that they are OK because the value of their 401K went up. In reality, it will have gone-up because of inflation, and if you do the math, you will see that not only did you lose purchasing power, but you also pay more in taxes. You are paying real taxes on phantom gains. This occurs even if tax rates don’t go up in the future. If rates go up, it gets even worse. Even ignoring the “fuzzy thinking” the example shows that the slow and steady saver will not be able to grow their money fast enough for a comfortable retirement. With life expectancy times growing past 100 years, ending up in returement years with more time than money is a challenge every middleclass earner must find a solution to today! I had become disillusioned with the stock market over the past two years, since the late 2008 melt down. I was thinking that surely there had to be a better way to save for retirement. Two years later, my balances are only a little better than they were in mid 2008. I realize this may seem like a shameless plug but BOY really does address all the misgivings I was having when I heard the radio ad that prompted me to check out the BOY website. I think it may be the most significant event that will happen in my life. Thank you!